This particular round was developed in 1969 following a DARPA (U.S. Department of Defense, Advanced Research Projects Agency) contract to a private firm (likely AAI Corporation, or Aircraft Armaments, Incorporated). The weapon itself was a modified Boys anti-tank rifle action fitted with a smoothbore barrel. It was originally designed with sniping as a primary role, but accuracy was so poor (10-shot groups of 6 to 8 feet at 600 yards were typical) that the project was soon abandoned. 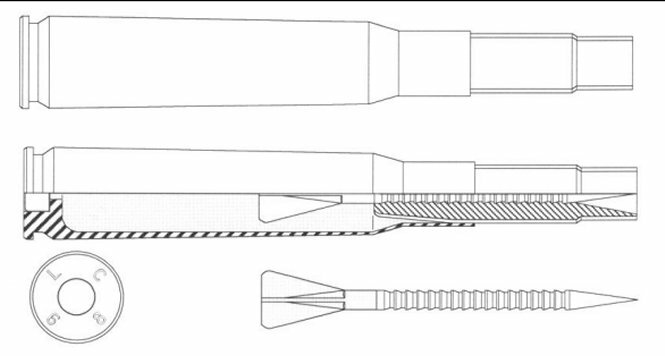 However, as an anti-material round at closer ranges the flechette would penetrate 2 inches of steel plate or 2 feet of concrete. The flechette, made of depleted uranium, which weighs 11.90 grams, has a muzzle velocity of 4,500 feet per second. This is an interesting opportunity to compare an actual specimen with the detailed drawings and compare the details. While the excellent drawings present all the details, the sectioned example provides a much better understanding of the concept.